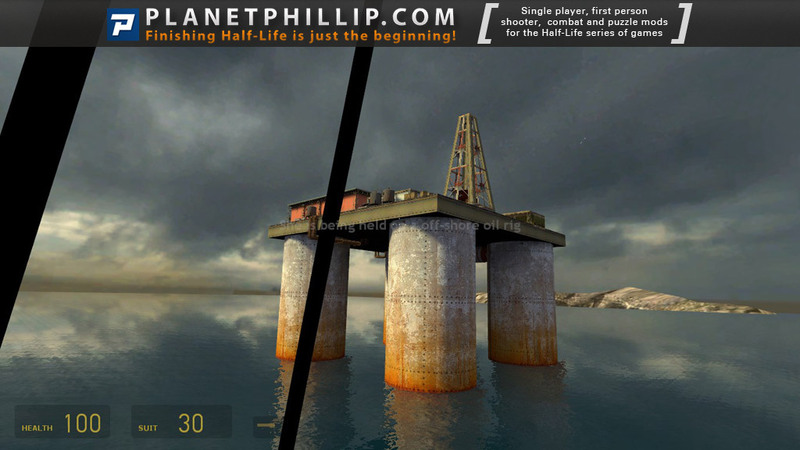 Copy R_Stevens_FrequentFlyers.bsp into your Half-Life 2: Episode Two Maps folder. Open the console and type map R_Stevens_FrequentFlyers. The last two screenshots are not attainable from within the map. You don’t get much for your bytes here but the start is so much fun I kinda wish that the helicopter just kept flying around the oil rig and even underneath. The mechanic is both interesting and frustrating, in that it can be hard to aim, which is half the challenge, the other half is that you don’t control the helicopter and are therefore unsure when it will change direction. Once you land, it’s simply a case of finding Alyx and leading her to the helicopter. 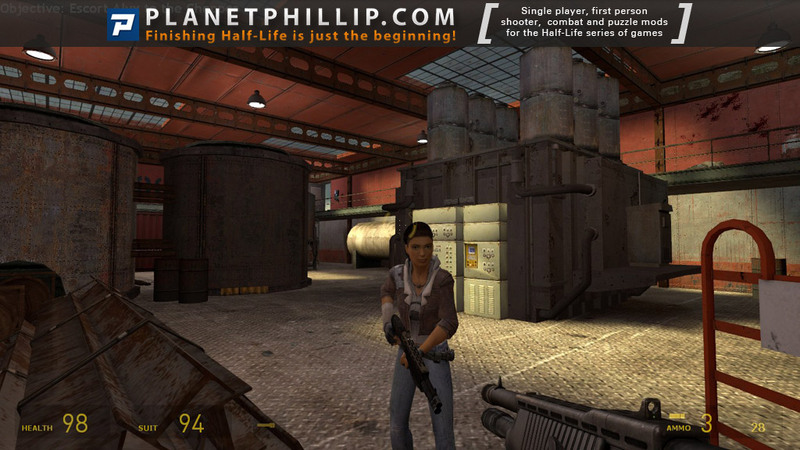 The ground assault is standard HL2 gameplay but you have a few routes to try. I experienced some stuttering but that’s not unusual these days. I did get stuck in a stairway with some crates but that’s because the lock is tied to the forcefield holding Alyx, so don’t try going down there until after freeing her. Worth a play, but the air attack should have been at the beginning and end, or maybe the whole thing! 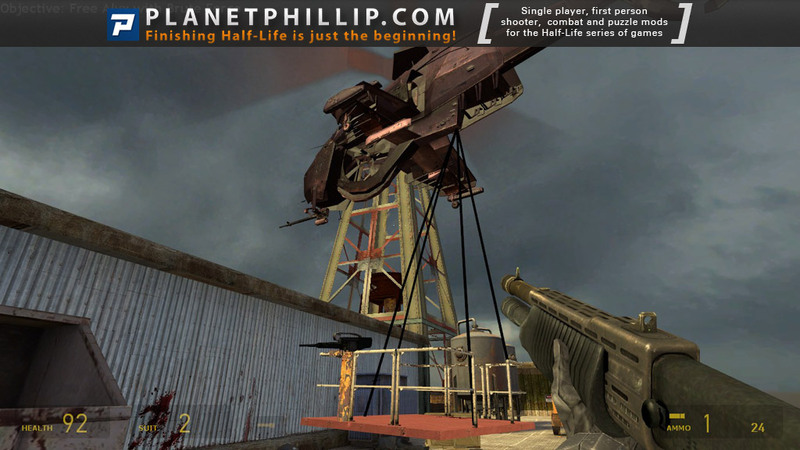 Correct me if I’m wrong but it’s only the second time I’ve seen a copter sequence in an HL mod’s (last time, it was in the grand finale of THEY HUNGER). Glad you got permission to post it — I’ve been salivating to play it ever since I found it. And glad it’s living up to expectations. It was fun, if nothing particularly notable. The chopper sequence was something a little different, and it was quite enjoyable. It would have been improved with some more complex fighting, and perhaps some maneuvers around the oilrig rather than just flying in a circle. I don’t get the impression it was an ambitious map, though, and for that it is still enjoyable. Departing at gate level design The oil rig is designed in a really fantastic way, although what’s really IN the actual oil rig is not that great. 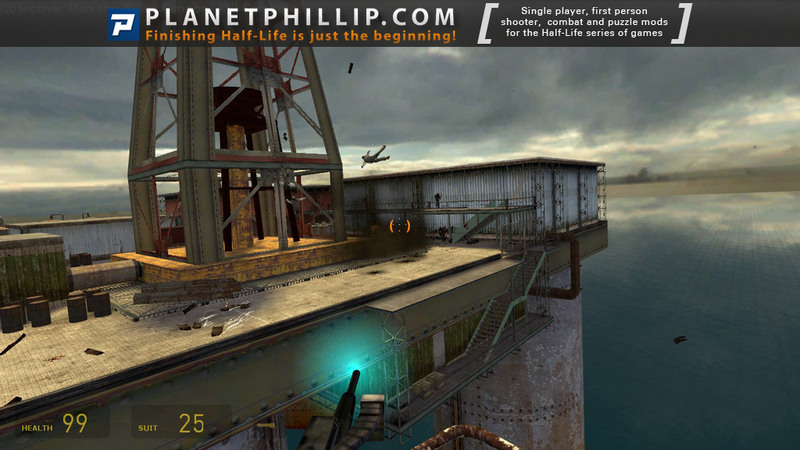 I think if the author went a little bit further and actually themed the oil rig and worked a little bit more on the interiors, he could have a great atmosphere for this short map. Flying for Dummies Surpsingly, the flying part of this map was my favorite part. Once the flying-shooting part started, I quickly said to myself: “boy, this sure looks like something out of a Call of Duty game”, and I enjoyed it. It is done flawlessly, and I could really see another mod improving on this gameplay mechanic and using it in the future. Turbulence comments This could have been so much more. As I said before, if the author had worked just a little bit more on the atmosphere and on the way he relays the messages (why not the rebel that’s driving the plane contacting you on radio? ), he could have a map that could fit right into Episode Three (like Sebastian and Episode One). Heck, in the end, he even says “Next Stop: Borealis”. Great idea, great new gameplay mechanic, well-executed, and most of all, FUN. Could have used a little more work on atmosphere and interior design, and how some of the messages are given to the player. Overall, a sweet short map. Nice little mod. I have not been offshore for a while and this was fun. The idea of mounting a gun on a moving platform beneath a helicopter is nuts! But it made for a entertaining ride and forced you to really concentrate on the accuracy of your shooting. A nice shootout on the way back escorting Alyx and done. What a great way to arrive at any Combine facility! I gave it high marks because I found it so much fun shooting Combine from the air. There is a .vmf file in the download in addition to the .bsp. Installation instructions say nothing about it, and there is no readme file other than the generic one. I don’t see other files of this type either. Seems like everyone else has instructions? You don’t need to do anything with that file, it’s for mappers who are interested in how the map was created. Awesome beginning!!! The rest of the map is classic. Easily one of the best Guildhall maps, Frequent Flyers pitches a legitimately fun gameplay mechanic and a short, entertaining proof-of-concept level to go with it. My only real criticism? It would be even better if you would randomize which of the buildings held Alyx. I was lucky and found her in the first building I tried, but that meant most of the oil rig went totally unexplored. If you randomized her location though – say there are a number of holding cells on this particular rig and she could randomly be in any one of them – I think you could have added a fair bit of replayability which is important for a short map like this. But as it stands, it’s a very good Guildhall map. As a matter of fact, I wonder : what is Guildhall? 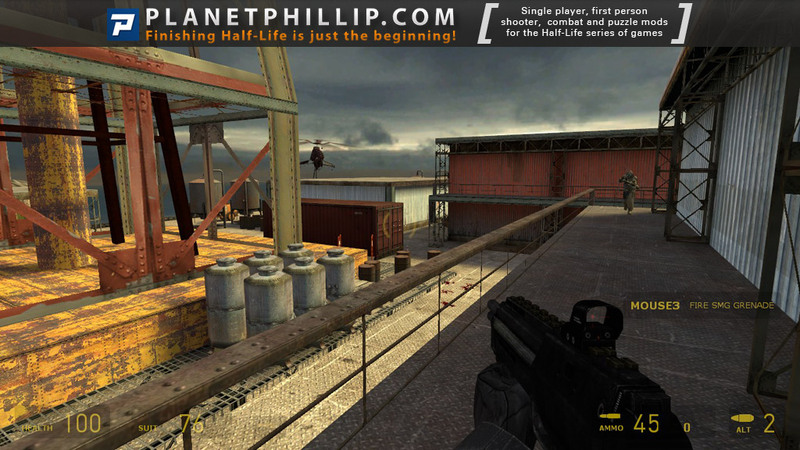 A group of modders focusing on new type of gameplay of HL? Guildhall is a program at the Southern Methodist University in Plano, Texas that teaches students about game design. I think it’s a graduate course, but I’m not sure. 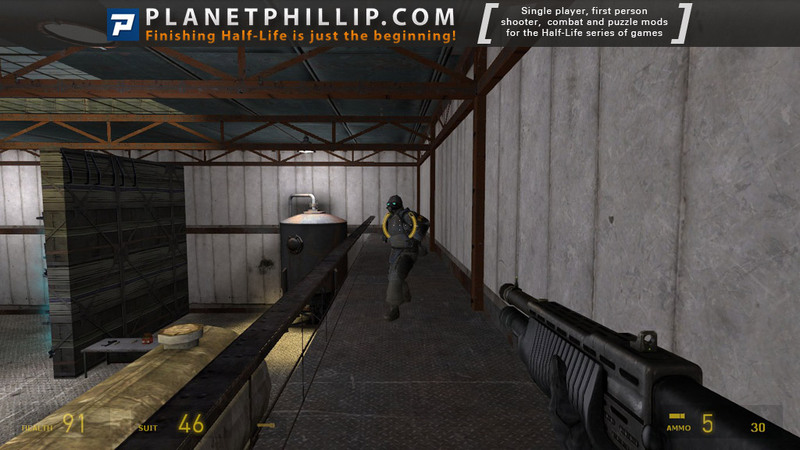 A lot of their work comes in the form of mods for various games. So, this map and others like it are really just part of the coursework – a homework assignment if you will. On the web page for this map, you can see what the assignment was specifically. Usually they have an elaborate design document to go with it. One interesting thing about the end result is that I think you can really tell who has a knack for game design and who doesn’t. Some of the maps are really fantastic while others aren’t. But they are almost universally short, because they only had a few weeks (if that) to make them. Guildhall is a game development school at methodist U. The ‘mechanic” was superbly done but superfluous as andyb points out. The gun, of course, should be mounted in the helicopter. It would be good if this was used in a different way. A brief commando style hostage rescue which was geat fun. Mounting the gun into the helicopter would have also given the author more control of the view. Because the platform is swinging on ropes attached to the helicopter, folks with motion sickness need not apply as the view can be downright nauseating! 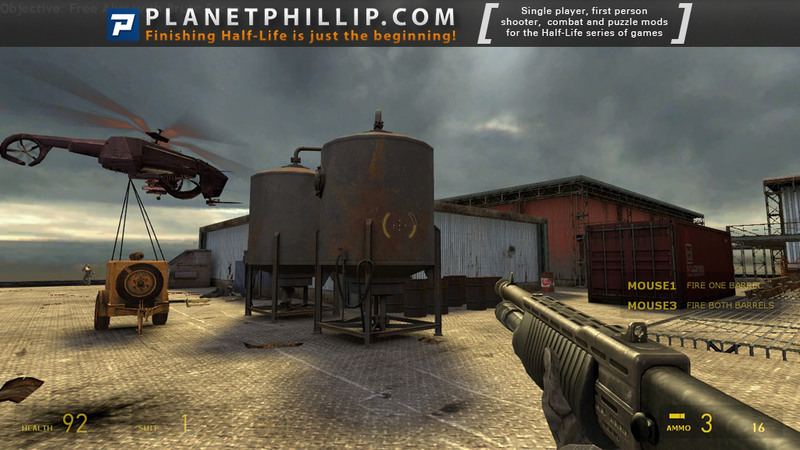 It would mean, however, that you’d have to model a helicopter with a full interior and exterior, since none of HL2’s assets have that. Given that this was a Guildhall assignment, it may have been outside the scope of the project. Still, I would encourage the author to revisit this concept, potentially as a RooftopVille entry, because it’s a fun idea and the mod has a good “get in, do a task, get out” structure to it. Also, I’m not really sure, but I don’t think the helicopter ride is totally inconsequential. The more Combine you kill in the chopper, the less you have to face on the ground, right? He spawns additional Combine no matter what, but I would imagine you’d have those and anyone you didn’t kill in the chopper, right? Loved this little piece. What a blast to ride in the chopper basket and trying to aim. I too would hope some talented mappers would use this concept in future maps. Fun fun fun. Compact and did I mention it was fun? It was short, nicely made, and fun for a few minutes of play. I did get myself stuck on that one section next to the platform, and noclipped out, that’s something that I do wish the authors had done a little better or more obviously. Also noted that the noises of hitting the gate/fence with the crowbar were inappropriate for that surface (wood sounds, instead of metal/grate). A delightful game and a great concept! 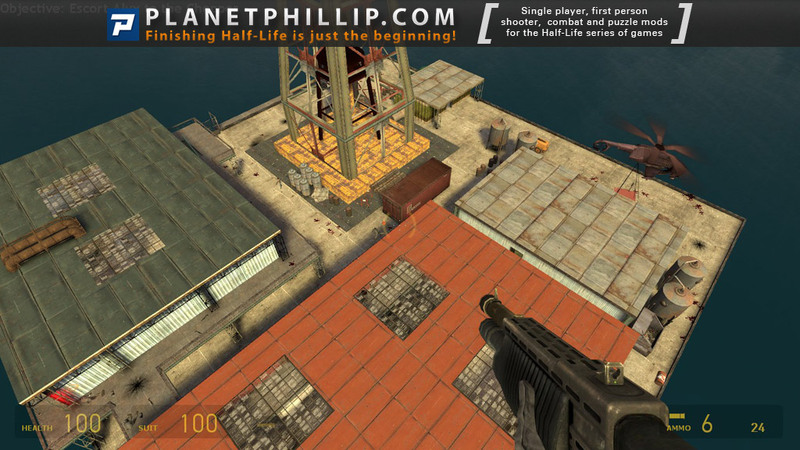 Just loved it, one of the greatest starts to any custom HL mod, I am currently playing Call of Duty Modern Warfare 2, this has a very similar rescue mission with helicopter attack on a oilrig. The opening sequence is well worth playing through a few times, both for fun and also to see just how many Combine you can take down. The rig layout while well designed was maybe just a bit thin, it would have been nice to have more content and other areas to battle through before reaching the goal. The combat is very much in your face and here again the reputability value is high and worth playing through again on harder levels. A fun mod to play looking forward to more from this author. This was a totally fun rescue map. Not an authentic looking oil rig but that didn’t matter as the gameplay was exciting and a challenge all the way through. Only PIL “cos it’s quite short! What there is, is first class! Short, but very very sweet. Brief and fun. My only complaint is that the platform you’re hanging from at the start sways a bit too crazily for you to get a proper fix on many of the enemies, but it’s still pretty sweet. I loved the beginning! Go into a little carrier that a friendly Chopper carries, and shoot the enemy Combine Soldiers, genius! After that I got bored. All we fight is Soldiers and some Shotgunners. Storyline was alright. I’d say, play this if you have no other better mods to play. Innovative. But I wish the ending I could have gotten back into the hanging helicopter platform at the end. Maybe blow up the whole rig. How I let pass this mod? ?, I don’t know but I know is a PF because I mean, is my kind of game! as the label says, I mean is my kind of mission, I love that utility with the heli at the beggining because u use the machinegun, to clean up first the petrol rig, so I love those two elemments well combined, so it’s great! 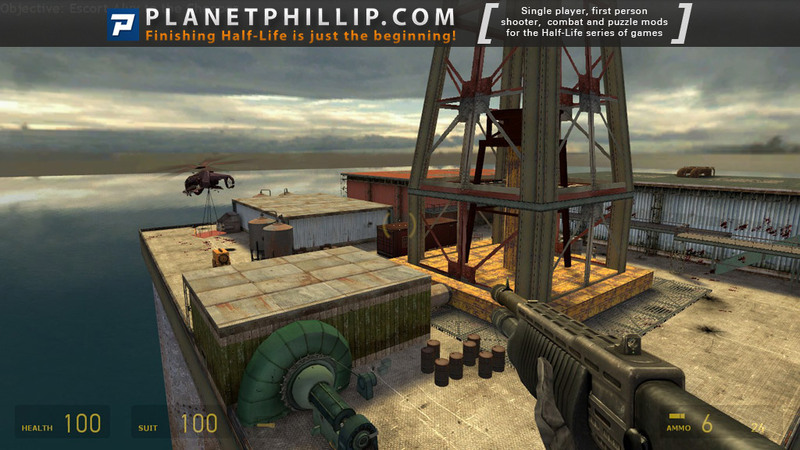 !, while I was playing this I tought: i’d love to see this map in CSS HARDWIRE mod, as a single mission with the cool fine weaponery there that would be so great, and I insist there should be a 2nd VERSSION of that CSS Hardwire, or at least some more maps add-ons!! 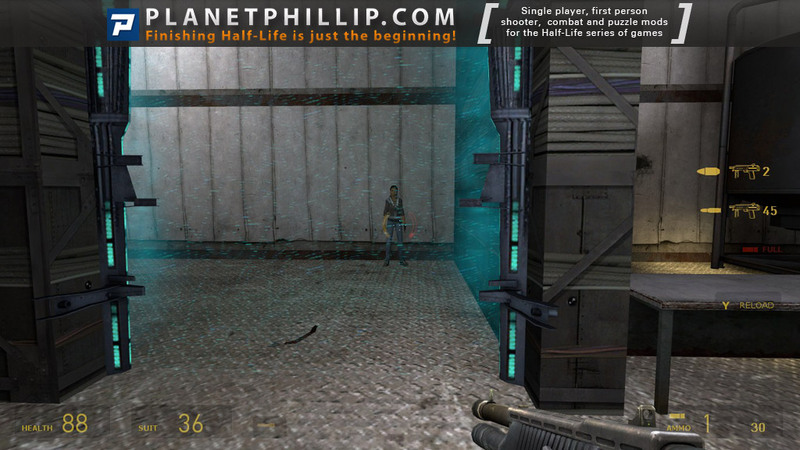 Back to this mod I loved it and go on and play it! !, you wont regret! When this first began, I thought I was gonna hate it. Trying to shoot everything whilst moving was so difficult at times and very annoying to me. Grrr so frustrating. Was so glad when it was over. lol I know I’m mad.. Okay, then touch down and I must say I stumbled and failed a few goes. So I tried again with an explore element rather than a gun ’em down in your face method. It worked (of course). Look for health and ammo as you take em on. The only annoying factor was Alex. She kept on stopping, arrgghh come on woman!! Otherwise, I have to say I loved this. It’s a personal fave now that remains installed. The negatives are just niggles as this is a belting map. Absolutely so so sooooo loved it. Play this! !